Environmental Education, which All Saints' defines as fostering a greater understanding of, and respect and appreciation for, the natural world, is an integral component of the school's Core Values. 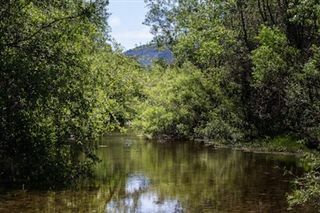 Situated at the base of the Santa Lucia Mountains and along the Carmel River, the school's very campus inspires love and respect for nature's beauty. Environmental Education is a key component of the science curriculum, but it is also a thread running through other subjects as well. Camping along the Big Sur River, exploring the Monterey Bay tidepools, examining rocks used for grinding by the Ohlone Native Americans, cross-country skiing in Yosemite, checking Carmel River water samples in our “backyard” and working in the All Saints’ Organic Garden – our classrooms are certainly not confined to buildings. Instead, we appreciate and respect that our natural world and surroundings provide the perfect environment for experiential learning. Outdoor education, adventure and appreciation is woven into the fabric of our school, and from the youngest students in ECU to those in 8th grade, they all get to learn from the outdoor environment and the larger world. In ECC and lower grade, students are enthusiastic as they are introduced to environmental science. They garden on campus, take field trips to farms, dairies, the forest, river, or ocean, raise butterflies for release and, in fourth and fifth grades, camp overnight under the stars and trees. Each adventure leads to new discoveries and fuels an enthusiasm for what the outdoor world offers. For middle school students, the Environmental Education program has a comprehensive curriculum and builds on their earlier years of experiences. Students travel to local "outdoor classrooms" such as the Monterey Bay for whale watching, Point Lobos, local tide pools, and the Monterey Bay Aquarium Research Institute. 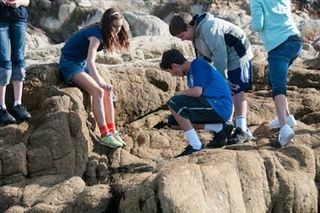 Sixth graders trips to the adjacent Carmel River are important to their study of ecology. As part of that study, they hatch steelhead eggs in a classroom aquarium as part of their investigation of the cycle of steelhead. They also attend Camp SeaLab in the fall. 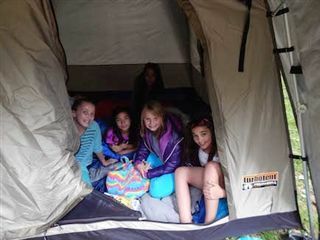 In addition to local field trips, seventh graders also have a week-long trip to the Marin Headlands in the spring where they are able to expand upon the ecology and environmental education learning they did in sixth grade, watersheds, pond and lagoon ecology, terrestrial plants and animlas, human impacts on ecosystems, and team building exercises are emphasized. Each winter, eighth graders attend the week-long Yosemite Institute program. Located on the Yosemite Valley floor and at the Flat Crane campus, students' acedemic study is combined with physical challenges, team building activities, and service projects. The emphasis is on the geology of Yosemite, forest ecology, cultural heritage, and stewardship. For many graduates, this is considered one of the highlighs of their time at All Saints'. The students lay looking up at the seemingly endless night sky filled with infinite lights, identifying the magnificent stars and constellations that have guided adventurers for centuries, with the guidance of their teacher. Incredibly, soon after discussing the phenomenon of shooting stars, the flash and trail of one such meteor appeared before their eyes. Indelible memories such as this are hallmarks of the annual eighth grade trip to the Yosemite Institute. It would be hard to argue that one of the most majestic “classrooms” in the world is Yosemite National Park. For over 25 years, our eighth graders have indeed been fortunate to spend a week actively engaged in field science studies with the sights, smells, and sounds of Yosemite as the backdrop. Providing countless opportunities for rich, inquiry-based learning and team-building activities, the week-long program at Yosemite Institute is a never to be forgotten experience. Reinforcing the concepts learned over the years in science, the students can actually see the incredible forces and actions of nature. Knowledge of geology, glaciation, natural history, ecology, Native American life, parasitism, watersheds, and the National Park system, among other topics, expand significantly under the tutelage of Yosemite Institute instructors. The students’ team skills, self-confidence and sense of accomplishment also exponentially enlarge as they tackle activities such as cross-country skiing, snowshoeing, and a trip through the pitch black, confined and physical demanding Spider Cave (the name alone is scary!) Through it all, the students gain greater appreciation for nature, science, and for each other. The truly remarkable week-long experience is one which is anticipated by All Saints’ students for years and surely never forgotten.